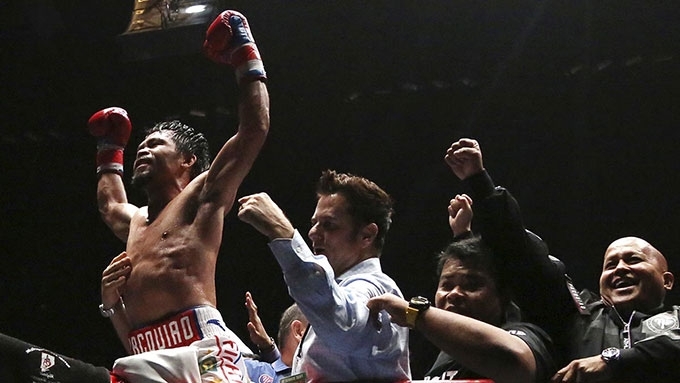 Manny Pacquiao defeats Lucas Matthysse via seventh-round knockout to get the World Boxing Association welterweight world title at Kuala Lumpur, Malaysia today, July 15. KUALA LUMPUR - Manny Pacquiao put on a vintage performance on Sunday, stopping Lucas Matthysse in the seventh round to wrest the Argentine's World Boxing Association (WBA) welterweight title. Pacquiao knocked Matthysse down in the third round with a wicked uppercut, forced him to take a knee in the fifth before dropping him a third time in the late seventh, prompting referee Kenny Bayless to stop the fight. The technical knockout at 2:43 of the seventh round marked the first time Pacquiao won via stoppage in close to a decade, or since 2009 when he stopped Miguel Cotto in the 12th round of their WBO weltetweight title showdown. The victory also served as a timely reminder of how good Pacquaio was amid mounting calls for his retirement - and of how dangerous he still is at age 39. “I was surprised because Matthysse is a very tough opponent and I knocked him down,” said Pacquiao, who prepared for this fight without longtime trainer Freddie Roach. “So that’s a bonus from being focused and patient in the fight and working hard in training camp." A crowd of about 9,000 at Axiata Arena that included President Duterte and Malaysian Premier Mahathir Mohamad erupted in celebration as Pacquiao climbed the top rope to acknowledge the cheers. Matthysse, who lost for only the fifth time in 44 career fights, later paid tribute to the Hall of Fame-bound icon. “He’s a great fighter. He’s a great champion. You win some, and you lose some. Today was my turn to lose, but I lost to a great fighter and a great legend in Manny Pacquiao," said the former champion from Argentina. As expected, Pacquiao (60-7-2, 38 KOs) declined to talk about his future plans, least of all retirement, after the 60th victory of a career spanning two decades. “That’s another story and another discussion. Right now I’m happy to go back to my country in the Philippines and to celebrate my victory and of course with my fellow countrymen, doing my job as a public servant.